This post may contain affilate links. For my full disclosure policy click here. What do 1 year olds like to do? One year olds are on the hunt for fun! They are much more mobile now and have a thirst for knowledge. They want to touch, smell, eat, and see everything! As their parent/guardian you are their teacher, so finding engaging activities to help them learn is essential. No need to feel the pressure though! At twelve months and older, toddlers can be amused with almost anything with a little creativity. A grocery store trip can be just as educational as a museum. 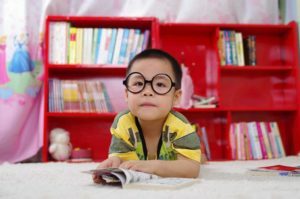 Read on for activities for 1 year olds that are fun for the whole family. Taking your one year old out in public can be challenging. Gone are the days when they could sit in their stroller peacefully for hours or nap anywhere. They want to be free to crawl, cruise or walk. When they are hungry they need real food. Toddler tantrums are real. 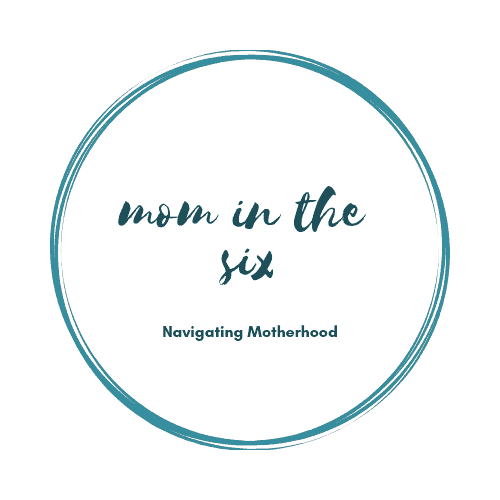 It all sounds intimidating, but everything can be managed with planning and fun can be had by all (even mom!). Tip #1: Don’t take on more than you’re comfortable with to start. If your toddler will only sleep at home, then choose activities that can be done before or after the nap – 1-2 hour commitment max. Yes, you may pay to enter and it seems like a waste to only spend a few hours somewhere, BUT your one year old is being stimulated, their little brains are taking it all in, they are seeing something new – worth every penny. If 1-2 hours sounds like too much – read on for places to go with a 1 year old that can be done in 30 minutes or less and build up to longer days out. Ever heard the term “hanger”? It’s a blend of anger and hungry. My one year old inherited this trait from her father. When she is hungry she gets very upset. So I always have snacks on hand. I found this container very useful – it allows little hands to get inside to get the treat, but closes – so when they inevitably shake or throw it everything doesn’t go flying out. Put cheerios, blueberries, crackers or cut up grapes inside. Avoid any sugary snacks as they will lead to an inevitable sugar crash. Tip #3: Don’t go alone. Grab your partner, friend or baby’s grandparent and head out together the first few times. Tip #4: If you’re driving, have one adult sit in the back to amuse your child. Sing songs, bring a few toys. Make the car ride a part of the fun. Tip #5: Don’t give up. Every parent has a bad day or outing. Shake it off and try again next week. 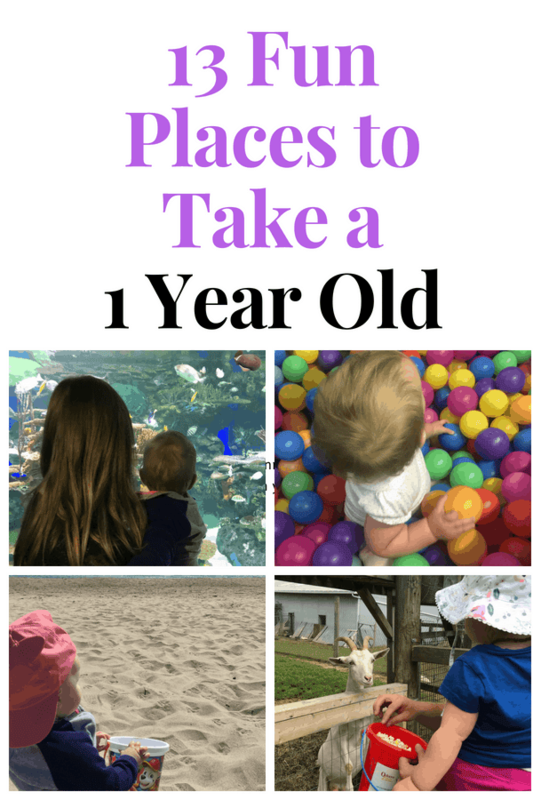 These places are all indoors and are great rainy day activities for 1 year olds. Libraries are great places for little ones rain or shine. Check your local library’s program schedule and look for toddler friendly activities – music or storytimes are favorites. If they don’t have any, your toddler will still love reading books and wandering the aisles. Some libraries may even have toys for them to play with. Find your nearest indoor playground and get ready to tire out your one year old! Many places have toddler specific areas for kids 3 and under that are designed to keep them safe, while allowing them to explore freely. The floors are padded, there are ball pits and slides. Bonus: they can’t get dirty like they do at the park. Tip 3: Explore the whole place – toddlers are allowed to explore everywhere so head down the big slides with them, jump in the ball pits and climb, climb, climb. 1. 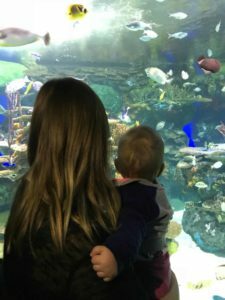 Improves Vocabulary – You can expand your one year old’s vocabulary beyond “fish” or “fishy” by stopping to point out new aquatic life. There are also lots of opportunities to point out differences between the fish – examples: size, colour, fast vs slow, etc. 2. Encourages Relaxation – Toddlers are bundles of energy sometimes. The calming nature of fish tanks has been studied by experts from the National Marine Aquarium, Plymouth University and the University of Exeter and they found that exposure to an aquarium can help reduce stress and anxiety. 3. Promotes an Appreciation for Nature – aquariums offer the opportunity to see creatures that may appear in their favorite books. They will be exposed to a world very different from what they are used to. Tip: Before you go to the aquarium you can pick up these books from the library or Amazon to get them ready to learn about the sea and the creatures living within it. Conservatories offer indoor protection from the elements and miles of nature to explore. Exposure to nature is so important for children’s well being and these beautiful greenhouse spaces are a great way for them to learn and see greenery when they can’t be outside. In 2005 the term “Nature deficit disorder” was coined. Childmind.org states that “the average American child is said to spend 4 to 7 minutes a day in unstructured play outdoors, and over 7 hours a day in front of a screen.” Conservatory’s are a great way to get your toddler “outside” without actually braving the rain or cold. Bonus: They are often free with an option to donate. If you have a children’s museum nearby these are wonderful places to take littles ones. They are specifically designed to stimulate children and unlike standard museums, they have a hands-on policy. Similar to aquariums – they will appeal to all types of learners. Early learning programs are offered for babies and up and can expose children to music and dance and help them learn skills like counting. Some centres offer drop in programs for when you are able to attend and others have weekly programs you sign up for. These are also great to expose your child to other children and adults and help them them learn to socialize. The grocery store may sound boring, but it is a great place to learn and explore. Shopping carts allow kids to be up higher and see more and there are many stimulating activities you can do while you shop. Play 1 Spy: A recent study determined that playing a version of I spy in the grocery store boosts early brain connections and will help your baby develop a stronger brain. The next time you walk through the fresh fruit and vegetable section of the supermarket with your little, one slow down and take your time and boost their little brains. For example say, “Look at the Green Broccoli” while holding the broccoli up. “Do you see the yellow lemons”, etc. It is never too early to do this one. If you are looking for a quick place to go before nap time or to spend a few hours somewhere, the following places can be done as slowly or as quickly as you like and some are often free. Not ready to go far from home yet? Make your backyard a destination for fun. These toys can make your backyard just as fun as a park, while having all the comforts of home a few steps away. My daughter will play at her water table for a good ten minutes, which in Toddler time means a LONG time. She also loves filling it up herself with the hose. We have this dinosaur themed pool and we LOVE it (check out the photo above with our daughter in it). I say we because my husband and I have both sat in it with our daughter and discussed how when she naps we are going back in. I like this basic slide because it has sides at the top to prevent your little one from falling off. Toddlers love climbing things so the stairs are great and learning to slide by themselves will make them so happy. Sandboxes will entertain your little one for a long time. And having a sandbox at home with a lid ensures your child is playing in clean sand. If the weather is nice pack up your little one and their swimsuit and head to a local splash pad. If they aren’t walking on their own yet then bring clothes you don’t mind getting wet and an extra towel for you too! 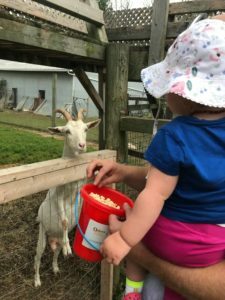 Get your toddler introduced to farm animals by taking them to a local petting zoo. They will typically have goats, cows, horses, donkeys, etc..and maybe even a few exotic animals like llamas. Petting zoos are smaller than a typical big city zoo making them a shorter trip and are interactive with the ability to touch and feed the animals. They are also less expensive and not as crowded. Beaches offer a lot of sensory stimulation. 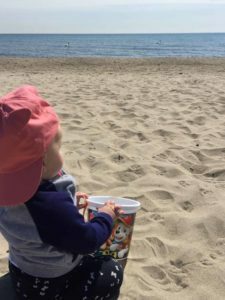 Placing water or sand in a bucket, making sand piles and smashing them, putting their hands in the water to splash all help their cognitive development. Expand their palettes by going to a food truck festival. You might be surprised by what foods they enjoy.